Runners are a unique and particular type of human. Let’s face it, we all have quirky habits that have to do with the sport. Have you ever found yourself doing something and thinking, “only another runner would understand?” It’s just the nature of any sport. Hands up if you have ever run around a parking lot or around the block to hit a perfect, even, or round number? It just feels more satisfying to see an even number. Does it matter? Probably not, but we are all guilty of it at some point. Have you ever been driving somewhere and seen someone running and immediately gotten jealous? Well, you are probably a runner then. I have found this is when I can’t run but seeing people out on a gorgeous day makes me want to go with them! There are so many different runner terms. 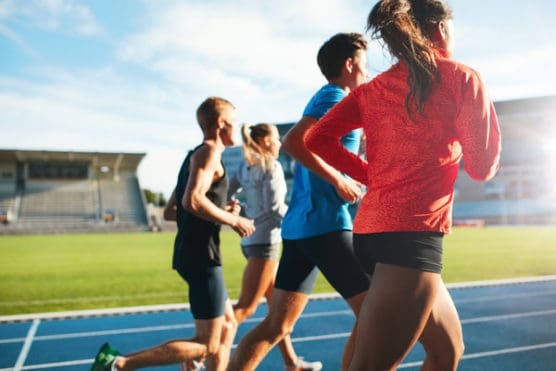 How many of your non-running friends have heard of the word fartlek? When my non-running friends asked how a race went, I usually say good or bad. When my running friends ask, I go into great detail with a race recap filled with runner lingo. Have you looked at yourself while running by a storefront? When I pass a storefront window, you better believe I’m checking myself out. I want to make sure my form is good, you have to look good for race photos right? We all hate when someone gets next to us on a treadmill, but how many people are guilty of checking out other runners’ treadmills to see how far or what pace they are going. Always stick to our treadmill, but have you ever started running next to someone and wondered what they are training for? Have you ever just started talking to someone at the start of a race or during a run? In running, we always seem to make friends with people in the oddest ways. I’m not always the most outgoing person, but I’ve seen someone wearing the same race shirt that I have, and started talking to them. There aren’t many sports you find yourself firing snot from your nose and people “seem” to be okay with it. Between snot rockets or even just spitting, it’s a wonder other runners hang out with us. When you around people just make sure to look before you rocket. No one wants snot on themselves, and no one especially wants your snot. Beware of wind direction, and it doesn’t fly back and hit you too. When you have to go, you have to go. Have you ever found yourself using the restroom outside, behind a tree, or looking for the closest porta potty? My guess is, non-runners would be mortified of the places we’ve all used the bathroom. These are just a few things that “only runners do”. What are some other things you would add?